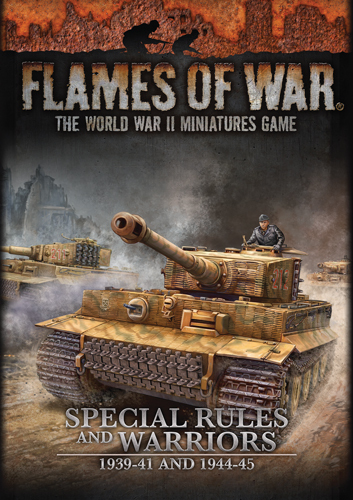 Since the release of the Flames Of War, Special Rules and Warriors book we have noticed a couple of errors. as well as some rules that could be worded better. Following is a short list of those corrections. Canadian Units do not use the British Bulldog special rule. Instead Canadian Units pass Rally and Remount Tests on a 3+. Instead of bringing your Air Observation Post on in the starting step, you may leave it off the table. Then reduce the roll required to get your Air Support to 3+. P38 Lightning MG should be labelled Cannon giving it ROF 2 (not 3). Clarification: You can now take the Panzerfaust Traps without taking von der Heydte. However, this does not mean you can take them twice (once with von der Heydte, and one by themselves), you may still only have up to four Panzerfaust Trap Teams in any Force. All Carbine, Rifle, Rifle/MG, and SMG Teams in a Parachute Rifle Company HQ and a Parachute Rifle Platoon carry Gammon Bombs giving them Tank Assault 3. Anti-tank rating of 3, FP 1+, verses Top Armour in Assaults. In the next enemy shooting step, enemy Teams equipped with Infra-Red Equipment in Line of Sight can be seen the Sd Kfz 251/20 (Uhu) half-track at any distance, but any team shooting at it still gets the additional +1 penalty To Hit for shooting at night. Teams from Udaney or Shock Units count as Skill Rating Veteran for all purposes excepted for the score needed To Hit them, which remains a 3+ for Trained. Zabolotny and his Engineer Sapper Platoon always pass Motivation Tests on a 2+. If your Force does not contain another Unit with the Infiltration special rule you may Infiltrate with Zabolotny. Zabolotny may infiltrate his Engineer Sapper Platoon. See the Infiltration rules on page 73 of the rulebook. Teams from Hero Units count as Skill Rating Veteran for all purposes excepted for the score needed To Hit them, which remains a 3+ for Trained. When compiling the rules updates for the Flames Of War, Special Rules and Warriors book we had to comb through all of our books to and find all the rules that needed to be looked at. Since the book was published we have noticed a few rules that got missed. Below you will find a list of additional rules updates missed out of the Flames Of War, Special Rules and Warriors book. Tetrarch, Tetrarch CS and Captured Sd Kfz 10/5 (2cm) Tank Teams use the Scout rule. Cromwell IV Tank Teams use the Scout rule. Cromwell IV and Cromwell VI CS Tank Teams use the Scout rule. A Heavy Armoured Car Platoon uses the Scout special rules. Armored Division Spearhead (page 230 Overlord). One Unit that is not a Spearhead Unit already may use the Spearhead rule if the Force is attacking in a Mission that is not a Meeting Engagement. Although a Breaching Group is a single Support choice, each Section operates as a separate Unit. The D7 Bulldozer is an Independent Tank Team. Teams from all Sections of a Breaching Group may not Charge into Contact. However, a D7 Bulldozer may Assault Bunkers (see page 76 and 80 of the rulebook). Teams from a Breeching Group may not be held in Reserves. See page 82 of the rulebook. An Assault Gun Platoon uses the Scout special rules. At the start of the game before deployment you may group all of the First Special Service Force Platoons’ M2 60mm Mortar Teams or M1 81mm Mortar Teams into a single new Mortar Platoon Unit. One Mortar Team becomes the Unit Leader. The Mortar Teams are no longer part of their original First Special Service Force Platoons. The Mortar Platoon counts as a Unit for all purposes. At the start of the game before deployment you may group all of the Dismounted Cavalry Platoons’ M2 60mm mortars into a single new Mortar Platoon Unit. One M2 60mm Mortar Team becomes the Unit Leader. The M2 Mortar Teams are no longer part of their original Dismounted Cavalry Platoons. The Mortar Platoon counts as a Unit for all purposes and may use the Mountain Training special rule. Towed Tank Destroyer Platoon teams may be place from Ambush within 16”/40cm of enemy teams as an exception to the normal Large Gun rules for placing Immobile Gun teams (see page 65 of the rulebook). Because the diagram does not divide the guns into Batteries, treat each pair of Platoons (four Gun Teams) as a Unit for the purposes of the Soviet Steel Wall rule (see page 73 of the rulebook).